A number of Judaica objects made in Jerusalem during the first decades of the twentieth century correspond closely to Ottoman examples from communities in present-day Turkey, such as Istanbul or Izmir. 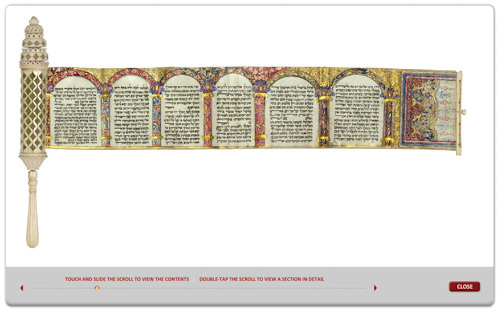 It is unclear if this scroll and case were made in Jerusalem, or if they were created elsewhere in Ottoman workshops. Jerusalem was under Ottoman rule through World War I, after which the British Mandate period be- gan. Jerusalem was also the location of the Bezalel School, which combined Islamic ornament with Orientalist and Art Nouveau elements to create a nationalistic style. This carved ivory Esther scroll case, with three graduated crowns ornamenting its top section, recalls silver Ottoman cases and Torah staves. The elaborate ivory piercing on the cylindrical shaft, reminiscent of architectural latticework, is an elegant feature of this piece. The overall form and decoration of this case suggests the refinement and exoticism of the Persian palatial setting of the Purim story. in the Islamic world. 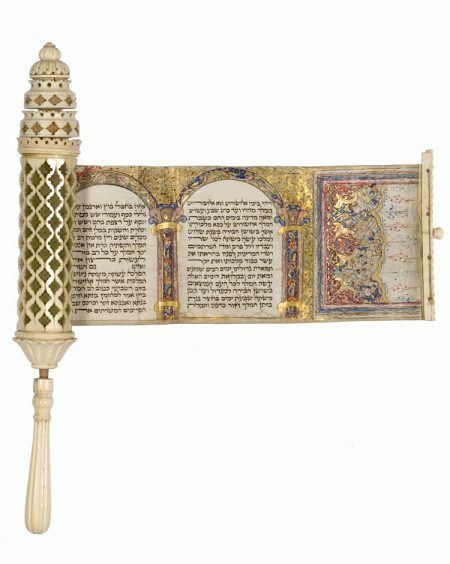 This specific megillah may be identified as a product of a Jerusalem-based atelier that produced vibrantly colored Esther and Song of Songs scrolls in the early twentieth century. The combination of traditional Islamic ornament with the highly saturated and Orientalist palette of blue and red, combined with a lavish use of gold, suggests that this scroll was produced in an envi- ronment that combined European and Ottoman influences. selected literature Sotheby’s New York 2005, lot 190.